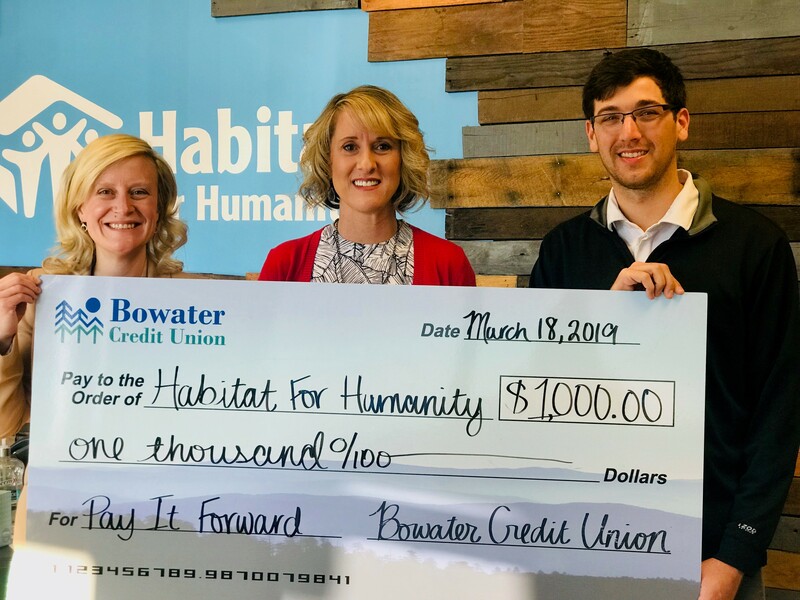 Bowater Employees Credit Union member Tammy Johnson has won $1,000 from Bowater Credit Union to her favorite non-profit, Habitat for Humanity of Cleveland, TN. Bowater Credit Union has asked its members to nominate their favorite non-profit helping people in the counties eligible for credit union membership: Bradley, McMinn, Meigs, Monroe, and Polk. Habitat for Humanity of Cleveland is the most first winner of 2019. Johnson knows first-hand how the winning organization improves the community we serve — in addition to being a credit union member, she is the Executive Director of Habitat for Humanity of Cleveland. The $1,000 prize will be used towards the 2019 Heroes Build. “This home build will engage veterans, military members and first responders who will volunteer to help build a home for the Brenda Walker family,” wrote Johnson. “Brenda Walker is a hard-working mother of two. Her current living situation is unhealthy, and she began looking for a better quality of life and a safe, secure environment. She applied, went through our stringent qualification process, and was accepted into the Habitat program. The Pay It Forward program will continue through 2019, and that means any member of Bowater Credit Union can nominate their favorite non-profit for a $1,000 Pay It Forward prize. Three more prizes will be given out in 2019, and the deadline to be considered for the next prize is August 31. Bowater Credit Union began the Pay It Forward program in 2010 as a way to give back to the community it serves. Since the program’s inception, Bowater CU has given $41,000 to various charities making a difference in our community.